Hello again from the fat Shneep! 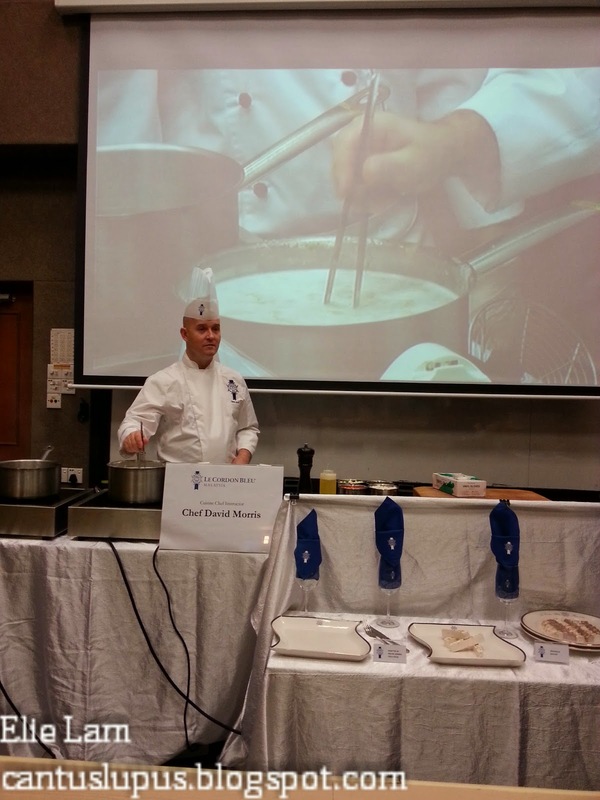 I'm really just dropping by today because I feel really guilty to have you guys hanging from my first mention of the day at Le Cordon Bleu and I never spoke about the second session after. But fret not, here it is! Born and bred in the rural areas of the United Kingdom, food from the land and sea is nothing new to the passionate Chef Morris who began to train as an apprentice in a leading Birmingham hotel in his young teenage days. Before long, Chef Morris found himself in Henley-on-Thames where he began to work under the wings of Head Chef Norman Cook at the Phyllis Court Club before being promoted as a Sous Chef and got himself promoted as the Executive Sous Chef at the Compleat Anglear Hotel in Marlow. In the year 2005, Chef Morris was crowned runner up as the Hampshire Chef of the Year and has helped design and open Shendish Manor in Hertfordshire, one of the best country house hotels today. 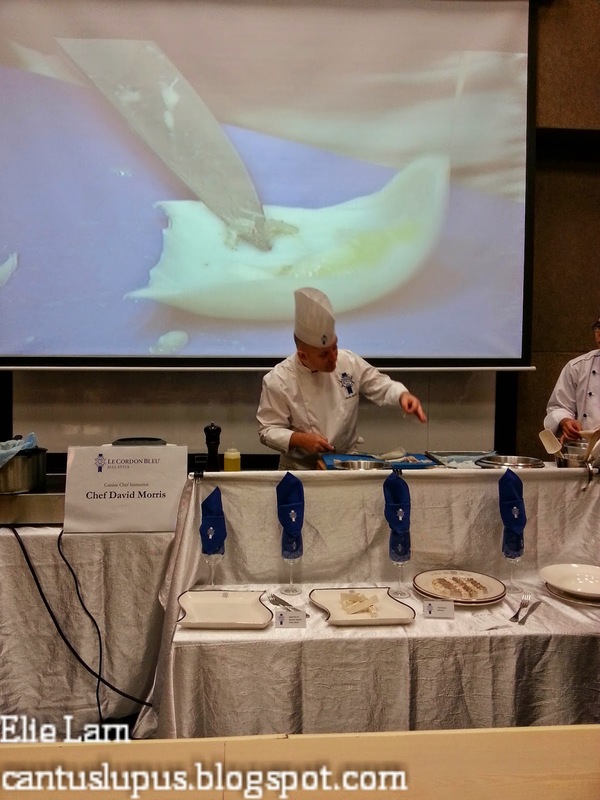 As a patient lecturer who makes sure his students understands each technique properly, he began the session with a really quirky posture; holding the knife up. I thought it was a really interesting way to speak to us because he explained to us how knives or any other thing around us isn't exactly as dangerous as we thought and the real danger in the kitchen was something closer to home. It was us, or rather our recklessness. It's something my brother has mentioned to me before and I do agree wholeheartedly. I mean, if you think about how a knife is dangerous, it's just about how we handle it. Logically speaking, I thought Chef Morris truly knew his deal and I wasn't wrong about that thought. And here's our our dish of the day; squid. The demonstration by Chef Morris was an Asian Inspired Consomme with Squid alongside Rosettes of Melon with Mango Chilli Salsa. With his new found love for chillies when he arrived Malaysia years ago, Chef Morris has constantly been instilling this spicy touch to all his creations. To him, a little bit of bird's eye chilli (Or chilli padi as we call it) was really needed for a tang on your tongue that leaves you partly gasping yet wanting more. And showing us what it's like to clean it thoroughly; inside and out. As someone who spends possibly only 10% of her life in the kitchen to date, I never knew there was so much to clean in a squid! I've always had them already cooked and deliciously battered or prepared in whatever way, I didn't even know the backbone of a squid resembled plastic pieces and there was a thing inside the squid that absolutely had to be removed (I think it was the teeth or something) that looks extremely small yet dangerous. All these were done and ready in a manner of minutes in the hands of Chef Morris in front of our eyes, people! Dealing with a paste made of white fish, squid trimmings and left overs of chilli, ginger and lemongrass. Making sure the paste in cold fish stock hasn't gotten burnt at the bottom of the pot. It was crucial in the creation of consommes that it doesn't get stirred yet doesn't get burned at the bottom with light taps of a chopstick and this was something we learned from Chef Morris. It would seem like the art of cooking wasn't just with your hands but also a coordination of your 5 senses. You had to see how clear the stock had boiled, smell if your ingredients have gone bad, taste if it has been seasoned well enough, hear if the consomme has burned and feel to know if everything was in place. Being a chef isn't an easy job. This is how you simmer. Our consomme is ready for dishing! 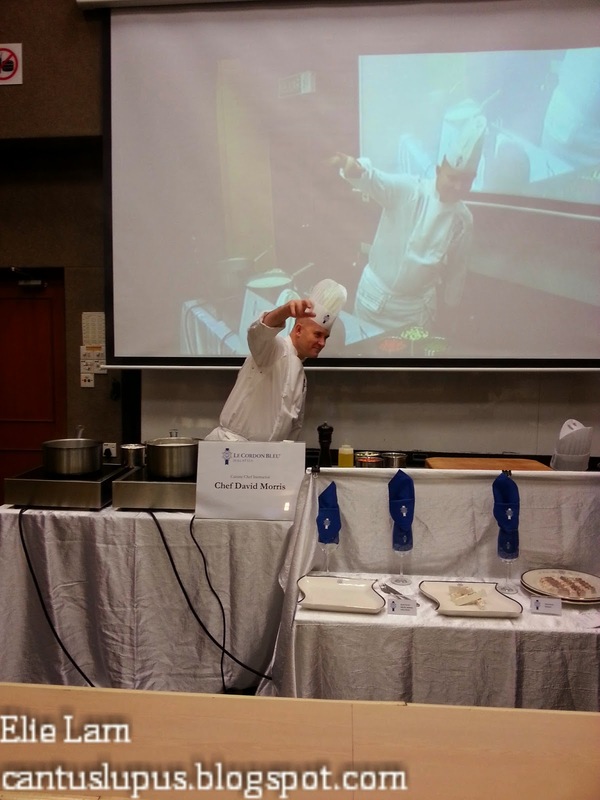 During the demonstration period, Chef Morris got us engaged in an interesting activity whereby he had us off our butts and do a little stretch in our arms. It was funny yet intriguing to know that this was how he is in classes too; making it less boring and as I believe, will definitely make it more memorable for his students to know what they are doing right (Or wrong) while cooking. Little touches to our Asian Inspired Consomme with Squid. Tada! Everything has been made from scratch, smack in front of our eyes! 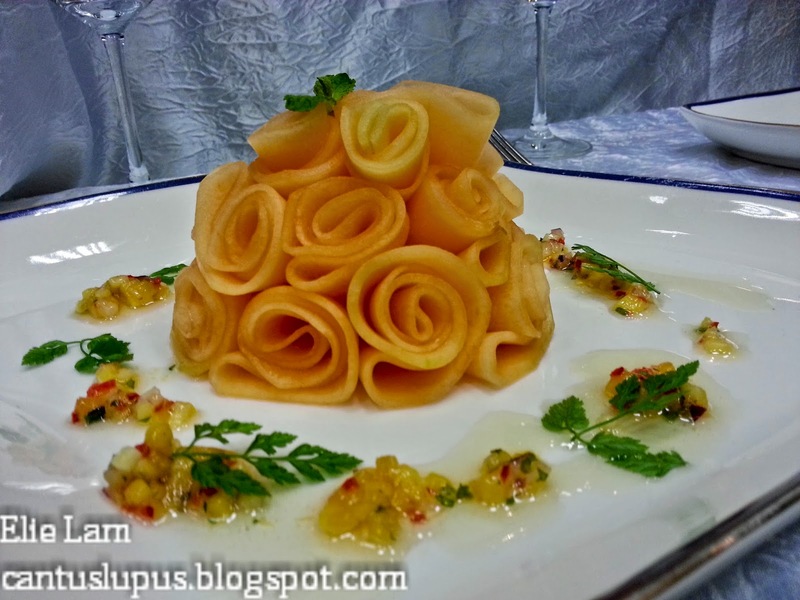 Rosettes of Melon with Mango Chilli Salsa. 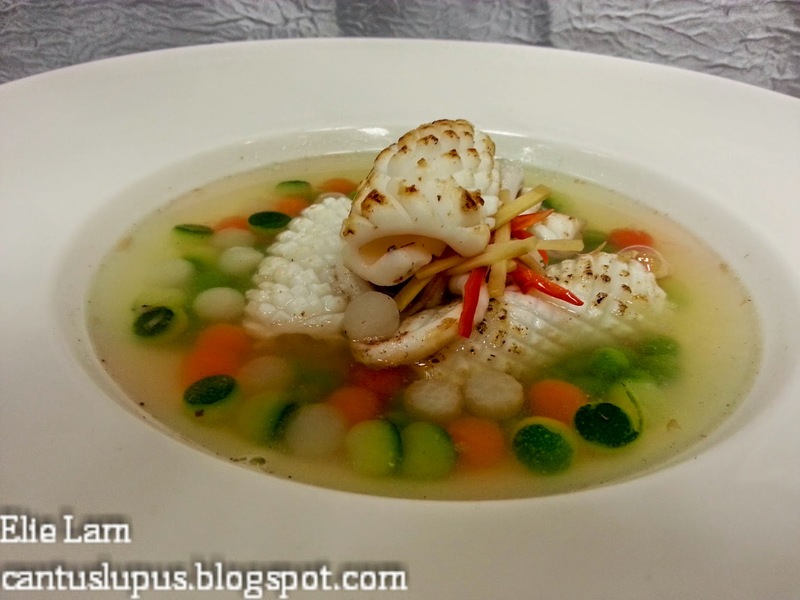 It was the first of my consomme experiences and truly something unexpected if you ask me. It wasn't overly coiling as how I expected the fish stock to be. In fact, it had that tangy twist with a bit of spicy taste and the scent of lemongrass all in one while the lightly grilled squid wasn't at all rubbery; a feat that some chefs may not achieve. While I didn't manage to take photos of how the rosettes of melon with mango chilli salsa was made, I can distinctively remember how Chef Morris has used a meat slicer to turn a really sweet rock melon into thin slices before hand-rolling them to resemble a rosette then drenched bits of the mango chilli salsa (That he made from scratch in front of our eyes, no less!) over the sides. The result was a sweet and flavourful appetizer that I wish I had more of. A tour to the kitchen. Much like the patissier kitchen, the cuisinier kitchen fits 16 students at every given time so everyone has their own counter tops to prepare their ingredients, cook up a storm then wash up before presenting it to Chef Morris to grade by the end of the class. It has been designed such as that Chef Morris could be standing exactly where I stood as this picture was taken and look out to his students so he knows if they've done something wrong. 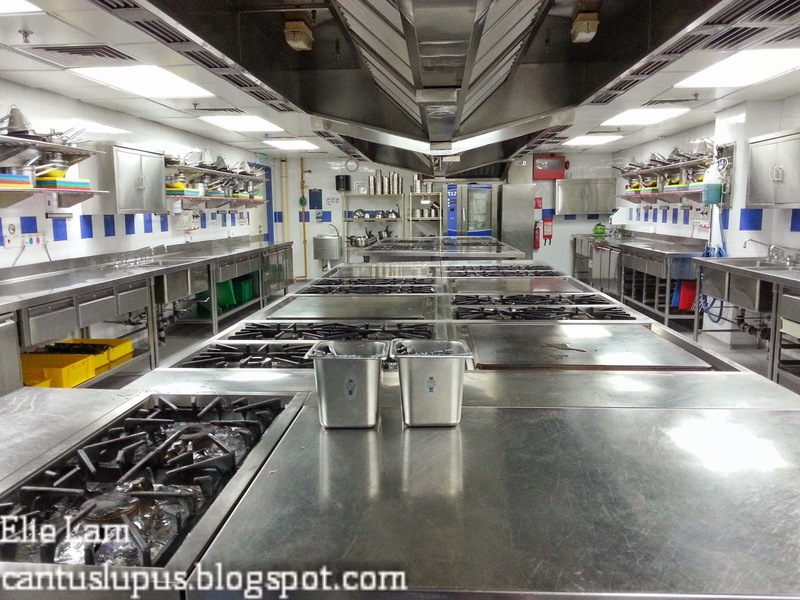 And may I just remind you that these kitchens costed RM 6 million to build in Sunway Le Cordon Bleu? You're welcome. 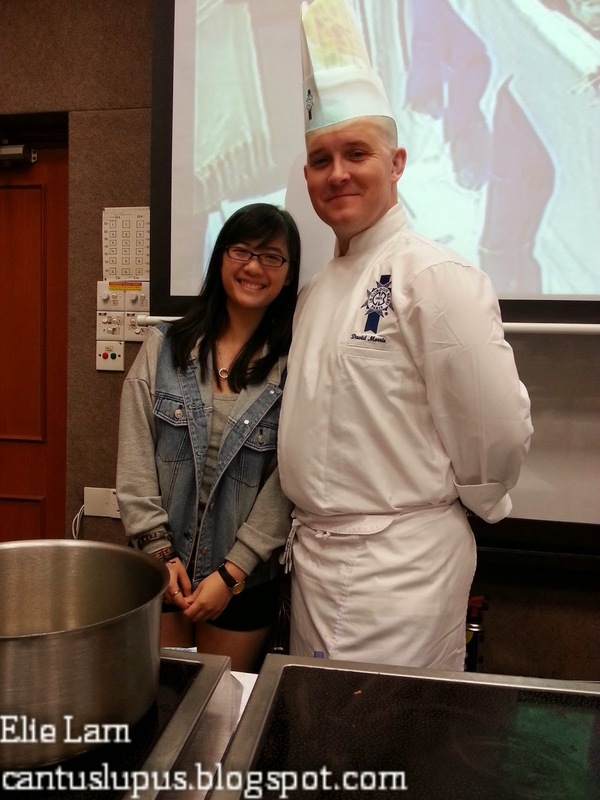 With Chef David Morris...lesser of a murderer when you've been in the demonstration long enough. 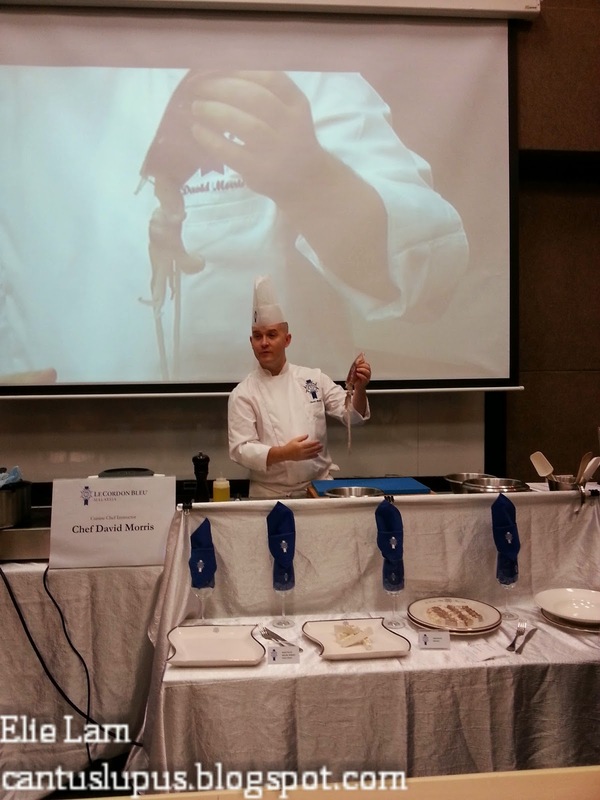 And that was how my Saturday went at Sunway Le Cordon Bleu. It was truly an eye opening experiences to watch as things were created in front of my face when hours ago, these materials were sitting separately from on another and were definitely not what they turned out to be. 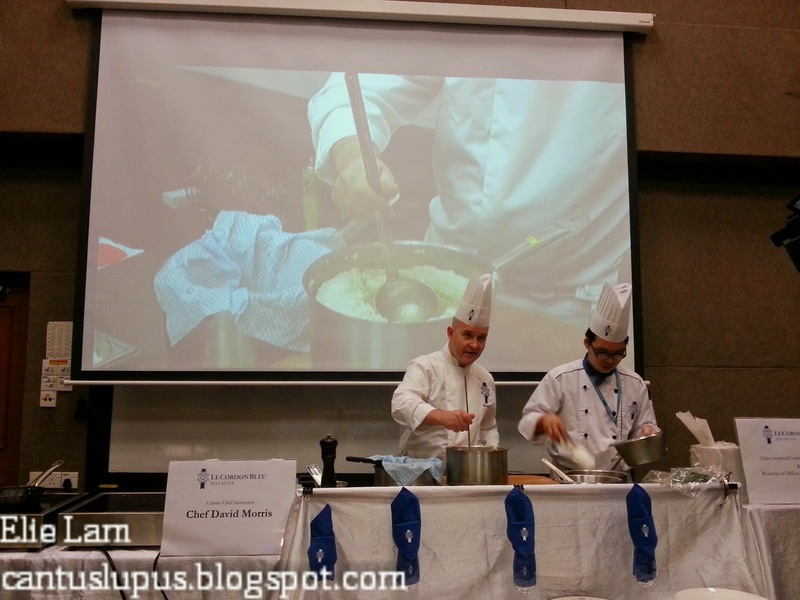 Visits around the campus also showed me that the kitchen was really well equipped and students in Sunway Le Cordon Bleu would definitely be getting a state of the art education in walking their paths to cook up a storm and make everyone's tummy happy. I just thought I should again thank ChurpChurp for the vouchers to this demonstration (That I almost did not turn up to!) 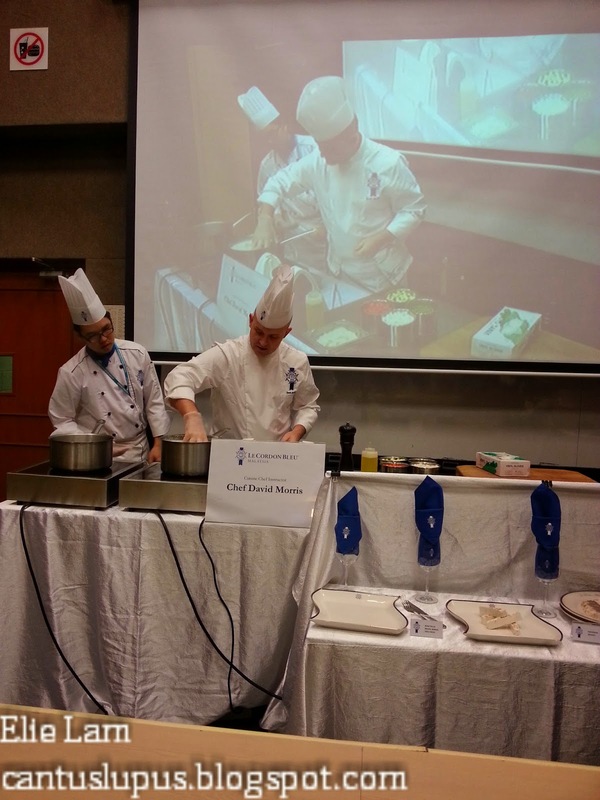 and Disney Malaysia in line with Sunway Le Cordon Bleu for arranging this amazing experience. 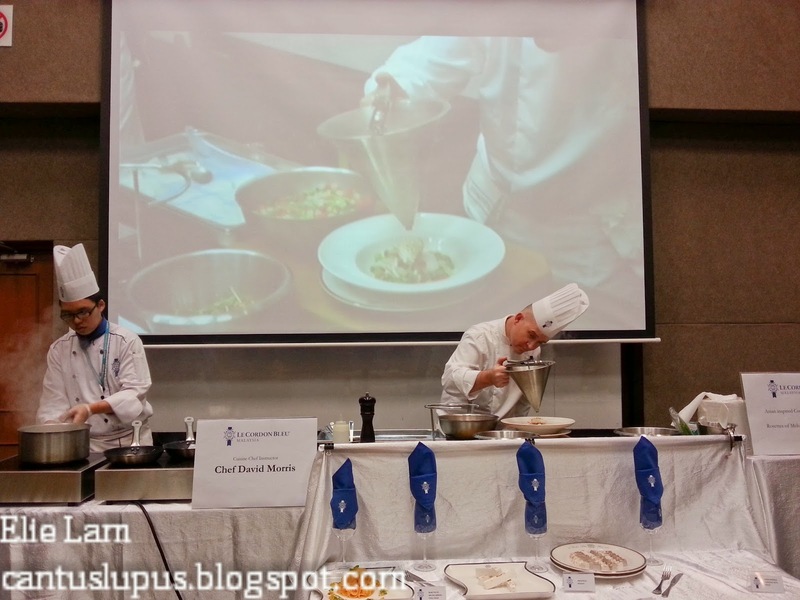 You could check out the official Le Cordon Bleu website to know more about enrollment details as well as scholarships that they offer right now at www.lecordonbleu.com.my or just head off to Sunway University College and ask for a good tour of the place. 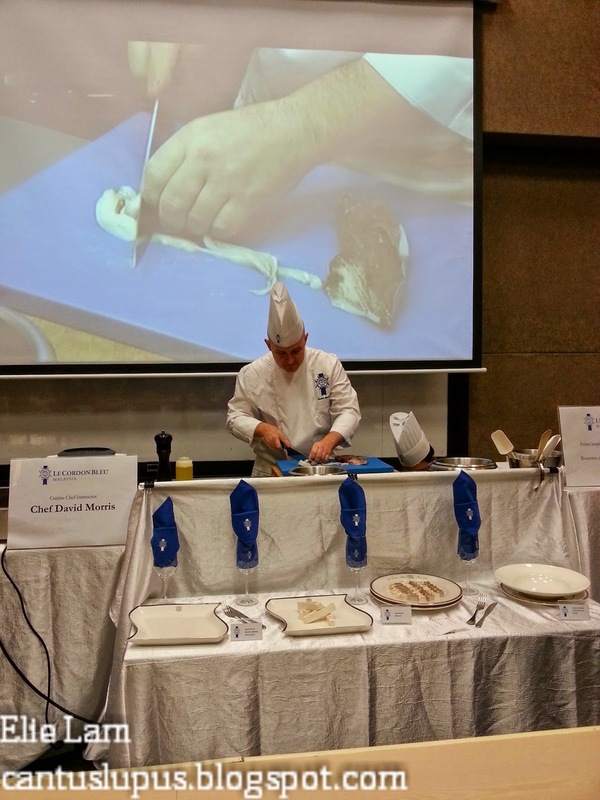 It's seriously not your regular campus where Le Cordon Bleu stands. Until then, I'm just going to have soup from the can because I can't make consommes...or rosettes of melon with mango chilli salsa. Yet. What a interesting article and thank you for writing about Chef Dave Morris , who i am proud to say is my son in law . You're very welcome. 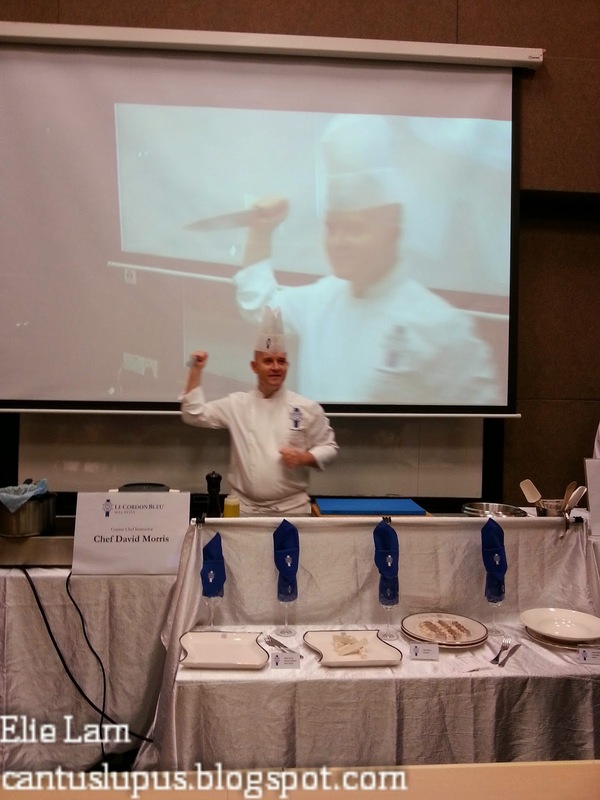 It's great to know that Chef Dave Morris is your son-in-law! He is indeed a lucky man to be in your family! His session was very enjoyable with extremely memorable moments that sticks to your head with minimum effort. Hope all is well with him and your loved ones.